Living Space: 3600 sq. 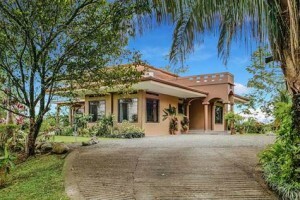 ft.
Casa Karisma is a prestigious estate property located within a high end residential development, overlooking the tropical jungles, palm plantations and with a stunning view of the ocean beyond the hills, lining the horizon. Casa Karisma has every possible amenity you would expect and demand, but is also one of the best values anywhere in the market place. This estate was built to American luxury standards and boasts 3600 sq feet with 5 comfortable, air conditioned bedrooms, 3 bathrooms and 3 spacious terraces which take full advantage of the beautiful scenery, ocean views and manicured gardens. Outside, in the spacious garden area, there is also a high end swimming pool built by award winning company “Aquarium Pools”. The home boosts a cooks kitchen, large and spacious common areas and an enormous master suite which takes in all the amazing views and serenity which the property has to offer. In addition, the home has been designed with rain water captation and filtration systems to insure sustainability both ecologically and financially allowing owners to mitigate the environmental impact of the home and use, while also saving money! The property offers both sunset ocean views as well as panoramic views of the Fila Chonta Mountain range making it an ideal spot to enjoy all the wonders and beautiful views so iconic to this area. The house is incredibly private, which in such a popular area, is a unique and distinguishing feature and is graced with daily visits from Titi monkeys, white faced Capuchin monkeys, toucans, motmots and parrots to name a few of the species which frequent the property. While you are able to take full advantage of that secluded “rainforest” setting. you are still only 2 miles from the village of Quepos. This small center of commerce and culture serves as the gateway to Manuel Antonio and its fabulous national park and beaches. In Quepos, you will find quaint restaurants, friendly bars, hotels, local bakeries, art galleries, gift shops, grocery stores, and the central market, and even a weekly farmers market. The home is an ideal full time residence or vacation rental property, which combines privacy, security, convenience and value. Inquire now for more information on this unique estate offering.